The biggest representative of Labidoghnath faune in Europe. 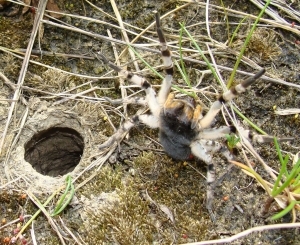 This kind was believed to be extinct in our area.The way of behaviour, cycle of evolution and appearance of wolf spider Lycosa singoriensis is an object of my research for a long time. Finds of „islands-like“ spreaded groups have considered my supposition that there could exist little population in southern Moravia (4.6.2007 – 9.6.2007). The population could expand and colonize suitable biotops if climate is friendly.